hi everyone, Darcy here to introduce another of my 'experimenters'. Tonight I leave you with Helen Chilton who has some fabulous ideas using Portfolio pastels. You really need to try these out. Hi Everyone, Helen here. This time I'm doing an experimental post (you know how I love experimenting) with Portfolios. We all know how great they are with water but I thought I'd also try them out with my heat gun. A heat gun with a stand is the best type to use here. Otherwise all you need are your Portfolios, a small fat metal palette knife, cocktail sticks and a stencil or two. 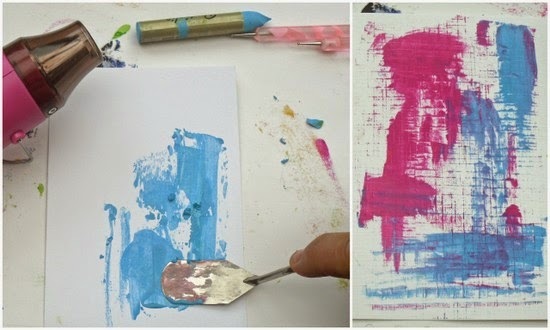 Scrape some shavings of your crayon onto card, Heat up the metal blade of the palette knife and start to squish. Then apply heat directly to melt the crayon and spread the colour out. Note: if you just go straight in with your heat gun, it'll blow the shavings away. Technique 2: Stencilling with melted crayon. Draw round the flower from stencil ELB 004 then shave some yellow onto the petal. Start heating from underneath to melt, then apply heat on top and spread out with cocktail stick. Technique 3: Colouring in with melted Portfolios. 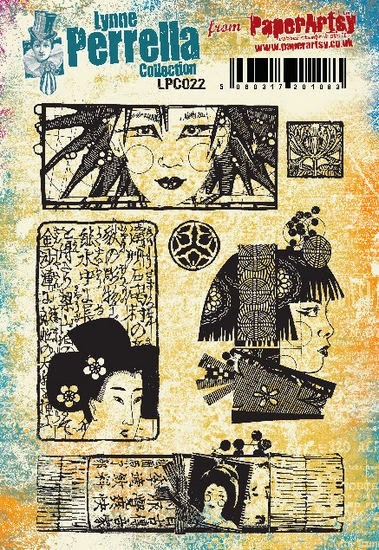 Technique 4: Making a stencil impression. And that's it for my experiments - I'm sure there's lots more you can do but I ran out of room! Here's a close up of the coloured stamped image. So, get out your Portfolios and your heat gun - I'd love to see what you come up with! Thanks Helen from all at PaperArtsy HQ. We love your experiments. Your whole approach to creating is so intuitive, we cannot fail to be inspired and encouraged. Using the Portfolios with the stencil is just genius. Playing with Portfolios sounds great fun and I love what Helen did with them, great colours! I love these experiments, helen, so vibrant and great to have some more ideas with my portfolios. Can't wait to play! I'm having a giggle as I read this Helen as I did this accidentally with Portfolios! Of course I didn't think to take it further like you have so wonderfully. My portfolios are coming out so I can experiment some more! I like these ideas a lot! And the finished piece is gorgeous.